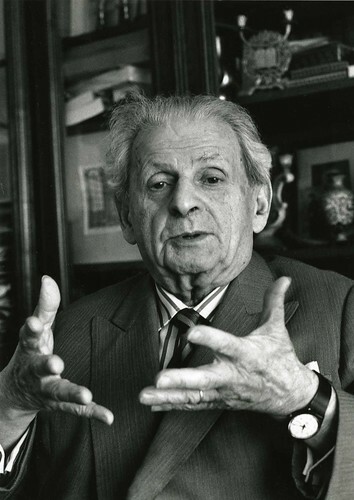 The philosopher Emmanuel Levinas has done some really interesting work on human subjectivity. Instead of locating the essence of the individual inside the self and calling the project of that self "freedom," Levinas writes of the subject as de-centered and vulnerable, and located outside of the self. Its project is not to free itself into authenticity but to be responsible to others. "The Levinasian subject has her center of gravity outside herself. Orbiting against her will, she is caught, like a planet, in the gravitational pull of a distant star. In 1514 Copernicus scandalously threatened the geocentric theory of the universe by suggesting that the sun, not the earth, occupies the center of the universe. Similarly (and also scandalously), Levinas dethrones the "I," the "ego," and "consciousness" from their privileged positions in the center of subjectivity. Unseating the "self" and replacing it with the "other," Levinas replaces freedom and the subject/object relation with responsibility and the intersubjective relation as the problems driving philosophy, making ethics the preeminent philosophical domain." The self, on this view, is not singular and freedom-seeking. It is multiple, fractured, relational, and fundamentally exposed. Its primary characteristic is not its strong will, but its vulnerability and sensitivity. Something like this thought occurred to me two nights ago as I churned along on a hard 10 miler. It had been a rough day in general, one of those days that you set out to get a lot of things done, but end up frittering away all that energy on worthless tasks. I was anxious and my will was scattered, unable to communicate with other people or to appreciate much at all. So I did what I often do to collect myself. I laced up the shoes and headed out the door. It was raining and dark, the kind of night where everything is blacked out, and everything moves through the world in a kind of ghostly hush. Most days I ease into my runs, but I headed out hard and impatient, looking to brush the limits of effort early, needing to touch something firm and real. To put it into Levinas' language, I needed to take control of my vulnerability. Runners talk a lot about pain, and when they do so they often talk about overcoming it, pushing through it, like it is something that we have to free ourselves from or master. Sometimes we take this relationship to it, to be sure. But the other night I needed the pain. I wanted the pain, like I wanted an old friend. Am I being clear? I ran hard out the door, at a pace that I knew I would have difficulty sustaining over 10 miles, and I achieved what I was looking for. By 10 minutes into the run, all of the various selves that had been battling each other over the course of the day, all of the anxious and unharnessed sensitivities that had been tearing at me, were exposed to a familiar old vulnerability. I ran hard and blind, not trying at all to free myself from the pain; I ran into it, playing with it, brushing up against its borders, and then pulling back when it became too much. By doing so, I reminded myself of the way in which my strength and my vulnerability are intimately tied together, not at odds with each other. The criterion of the strength of the self is its ability to respond to exposure, not its ability to stay intact. My long practice with running has given me a way of caring for myself, not by making myself tough and inured to pain, but actually giving me a space in which I can practice being exposed to pain, responding to pain, living with pain, and actually finding joy and power through the encounter with pain. To live in the world fully does not mean freeing one's self from suffering. It means being able to find joy through suffering. It means being able to locate the self precisely in moments of great vulnerability. We are at our best when we are responsive to others, and this means risking having one's self broken, bound, and placed into relationships of dependency to other people, things, places, and practices. I find strength in my running precisely because through running I am able to break myself open and expose myself to weakness. I find control by brushing up against the limits of myself, not by overcoming the pain, but by succumbing to its wild and living intensities. As I pounded across the black pavement among the mute and indifferent traffic, raging quietly, skimming lightly, I was haunted by the thought of being alone. But the run did wind its way, as they all do, back to my doorstep. I stood outside and stretched my calves. My chest stopped heaving, the blood drained from my rushing ears. Then, I opened the door. "How was the run?" called my wife from the back room. The house was well-lit and she had turned on the heat. "It was a good one," I called back. "I had a long day, but I feel better now." "It's good to see you." "You, too." And like that I returned to more familiar tasks, happy to be warm, happy to be home. Free wasn't the way I'd describe myself. More open is perhaps the way I'd put it--happy to be able to help prepare dinner, wanting to listen to my wife, able to respond, responsible. Great post, well written. I can definitely identify with what you're saying. Thanks, Dan, for reading and commenting. Cheers!